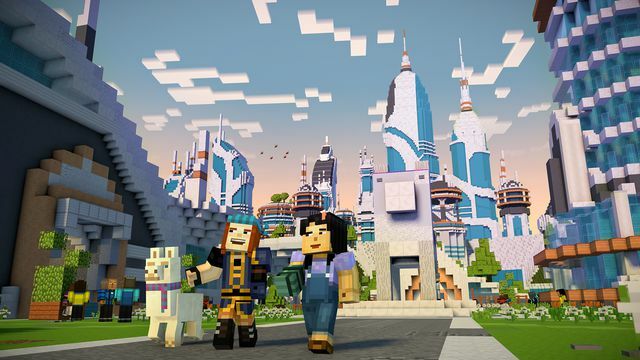 Minecraft: Story Mode, the episodic adventure game based on Mojang’s Minecraft, will continue with a second season next month, developer Telltale Games announced today. The season premiere, “Hero in Residence,” will begin rolling out July 11. It will be available digitally on Android, iOS, Mac, PlayStation 4, Windows PC and Xbox One that week, and Telltale will release a physical copy of the season this fall. Telltale said today in a news release that players’ choices from the first season will carry over to the upcoming season. Minecraft: Story Mode debuted in October 2015 and was originally a five-part series that ended in March 2016. However, Telltale extended the season with three additional episodes, with the eighth chapter launching in September 2016. Minecraft: Story Mode - Season 2 is currently scheduled to run for five episodes. "Now that Jesse and the gang have vanquished the Wither Storm, saved the world, and become totally super famous heroes, life has gotten a bit more...complicated. With more responsibilities and less time for adventure, old friendships have started to fade — at least until Jesse's hand gets stuck in a creepy gauntlet that belongs to an ancient underwater temple. Together with old pals and new comrades alike, Jesse embarks on a brand new journey filled with tough choices, good times, and at least one temperamental llama." In addition to Oswalt and Taber, Ashley Johnson and Scott Porter will return for the second season. Once again, Telltale will bring in members of the Minecraft community such as Stampy Cat and stacyplays for cameos. The season will support Telltale’s Crowd Play feature, which allows for up to 2,000 people to participate along with the player.